The shoulders are from Rohan, and I really like how sleek they are. The cape was a happy addition — I got that from a quest reward in Dunland when I went back to do some virtues there. I’m actually not that keen on capes usually, but this one I just love. Everything is dyed black to bring out the accent colors. I haven’t really settled on a head item for this — or decided if it’s even necessary. 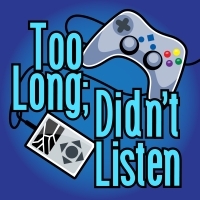 Too Long; Didn’t Listen episode 54 is up! Love is a funny thing and not just contained to February 14th. 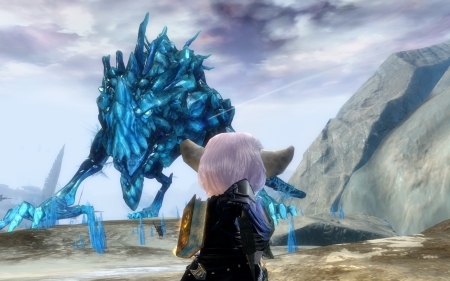 Dodge and Syp reveal their true love for… MMOs. Between them is nothing but a black chasm of hatred, however. Today’s agenda is to talk about the love and hate relating to MMOs. Let’s just hope the latter doesn’t win out! Listen to episode 54 here! Was it just two days ago that I said I was going to start working on shoring up the 20-or-so virtues I needed on my Captain? My, my, a lot has happened since then. I really overestimated how long this would all take, as I’ve shot from rank 1 of Zeal to rank 13 while picking up two other virtues I’ve needed in that span of time. It helped that I had made *some* progress on these virtues when I was leveling, and it really helped that I’m so overleveled for most of these regions that I can slaughter and travel with impunity. There’s been a great side benefit of all of this: I’m going on a lightning tour of all these zones I haven’t seen in ages. Oh hey Forochel, still being awesome in the far north? Still taunting me with those groovy mammoth mounts? Cool, cool. Oh hey Angmar, still the ugliest place in the world? Sky still inexplicably red with weird artifacts streaking across them? Mhm. Oh hey Mirkwood, I kind of miss hanging out in your semi-gothic neck of the woods. It’s really so different when you return to these places as a high-level character. It’s like being treated to god mode, or like returning to your high school 20 years later. Everything that seemed so intimidating and challenging at the time is now smaller and almost quaint. It’s also blissful being able to travel around without having to worry about aggroing mobs every ten steps. I even saw places I’d never seen before, like the elite giant-infested towns of the Misty Mountains. The tour also made me realize just how huge this game’s become. It’s an enormous world, with 34 zones and counting, and it’s spread all over the map now. It’s hard to remember what it was like when we were cooped up in just a pocket of Eriador. I wasn’t there at the time, but the first steps through the Misty Mountains via Moria must’ve been like the jailer opening the door and allowing the inmates to finally see what else is out there. 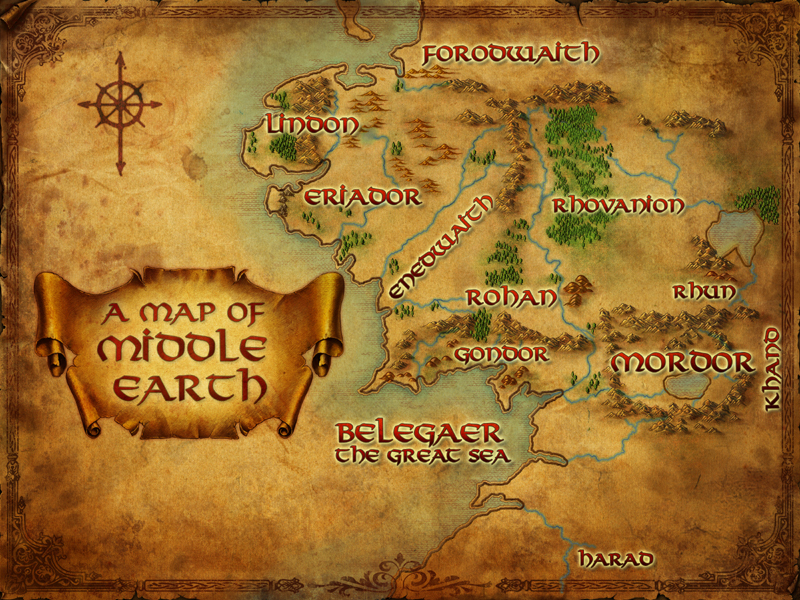 There’s a lot of criticism, valid and stupid, levied against LOTRO these days, but I have to say that there’s something really special about the growth of this game world and the adherence to the books. It feels more real and tangible than many other MMOs I’ve played, a place with a sense of history and culture. I’m kind of glad I’ve gone on this virtue-or-bust tour to be reminded of the larger world, not just the little section I’ve been fiddling around in for the past half-year. Last night I was feeling a Guild Wars 2 jonesing, so I decided to make it 100% about that game all evening. 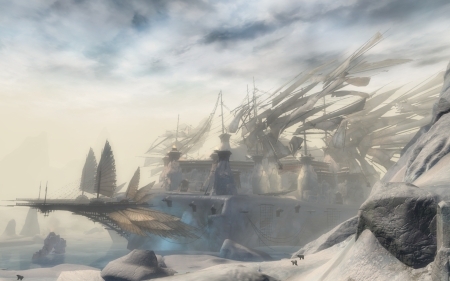 My engineer is currently plowing through the high-level zones in her madcap world completion quest, and that night’s focus was the frozen Frostgorge Sound. I got into an exploration groove that started to go surprisingly well. Around the two-hour mark, I realized that I could actually wrap up an entire zone in a single outing, which got me super-motivated to finish it before bedtime. It helped that none of the vistas were tricky jumping puzzles and that there were relatively few heart quests to slow me down. Actually, the whole zone felt really balanced between the four types of exploration points, and I even had time to stop for a couple of events. Right before I finished up my last two unlocks, I saw the shadow of a giant ice dragon in the distance and decided to check it out. I guess it was the big zone boss fight, and how can one say no to that? I yoinked a bazooka and joined the crowd of players to take him down. I especially loved the dragon’s animations and how it flew from one site to another, causing the whole attacking throng to make a dash for the new locale. We got him down with few problems and I raked in some nice treasure for my troubles. So that was that. One zone knocked out in an evening, and it felt good. I think I’m going to take a small break from world completion to work on my character’s personal storyline, which is still at… um… level 22. LOTRO: Angel of Death incoming! 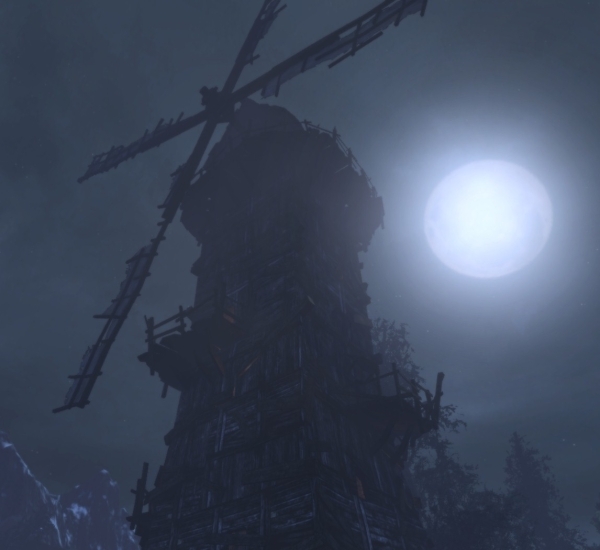 As kind of an epilogue/side-story to the previous post, last night I was blitzing through a goblin camp in North Downs for an easy rank of Zeal. There is a certain joy in being a level 81 tank with thousands of DPS who can one-shot everything with any of my skills, even the healing one and the one that makes people bow down before me. I made it a game to see how quickly and efficiently I could dash through the camp, kill everything, and then patiently wait for two minutes while it all respawned. But it wasn’t until this morning that I looked at this experience through the eyes of the poor goblins and realized just how traumatic it must’ve been. There they are, just minding their own business, staying the heck away from any other settlements, and mostly camping out underneath the open stars. They while away the day by whittling sticks, putting their valuables (such as they are) into giant treasure chests, and petting their many adorable doggies. Then a trumpet sounds and gouts of blood start erupting from outside the gate. A maniac woman wielding a six-foot great axe comes barreling through, cleaving the advance guards in twain with no effort. Behind her floats a spectral nightmare, a ghost archer who starts skewering any target the crazed valkyrie hasn’t killed yet. There’s nowhere to go, nowhere to retreat to, just seconds left as death arrives in the form of a 30 mph sprinting full-plated warrior. The goblins never have a chance to even attack once before their heads are rolling around in the globby black blood on the ground. There’s no time to process the horrible nightmare that has descended upon this terrible day — no time, that is, until souls are yanked back from the great beyond, bodies are stitched back up, and firm invisible hands hold each terrified resurrected goblin in place while the angel of death returns. Then again, quick rank of zeal. Score! 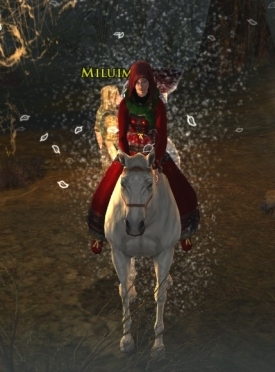 My Captain in LOTRO is the longest-running character I’ve played, not just in that game but any MMO at all. I think she came into existence around 2008, sat on the backburner until I got back into the game in 2010, and has been a companion ever since. Sure, we have our periods of falling out where I start to look for a new date to the prom, but I just can’t quit her. She completes me. She’s also starting to fall apart due to neglect. Over the past couple weeks I’ve been experimenting with various alts in the game, and due to a laser-intense focus on building those characters right did I realize just how shoddy my Captain’s build had become. LIs and legacies? I just go with whatever, couldn’t be bothered to fine-tune those weapons. And the worst are her virtues, which I chose back in 2008 and stopped actively pursuing in 2011. So I decided that the old lady needs a fresh coat of paint, and thus I took a reprieve from my adventures through Rohan (now with 100% more horsemeat burgers!) to see what I could do about shoring everything up. One of her virtues, Determination, had to be scrapped entirely. I don’t know what I was thinking by focusing on agility — maybe it was more beneficial for Cappies way back when? — but I know that I need Zeal and all of its yummy, yummy morale. Unfortunately, I had accumulated a grand whopping total of one Zeal rank by now, which meant that I had 15 ranks to make up for in addition to about five ranks in total to bring my other virtues from 14 or 15 up to 16. So I mapped out what had to be done and now I’m on a crazy tour back through earlier zones, slaughtering wildlife with abandon just to prove what a sterling hero I am. And you can’t have a makeover project without redoing outfits, so I’m working on assembling her a few spiffy new duds so I don’t look so… generic. There is a skirmish vendor armor set I want to buy that looks just incredible, so I think I’ll be doing that before too long. Anyway, it’s a good feeling to be actively working on bringing her up to par and making her even better than before.